Baseball is a popular pastime for children and adults alike. Baseball fields typically have red clay dirt surfaces. While the red clay dirt looks nice from the stands, it stains baseball uniforms quite easily. 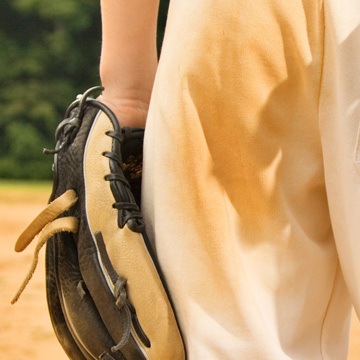 Treat red clay dirt stains on baseball uniforms with supplies from home for successful removal. For the easiest removal, tackle red clay dirt stains as soon as possible so they don't have time to set in. Lay a clean towel on a flat work surface so you don't transfer the red clay dirt stains from the baseball uniform to your work surface. Launder your baseball uniform according to directions. If the red clay dirt stain is still present or partially present after washing, tackle it with a paste of equal parts dishwasher detergent and water. Scrub the dishwasher detergent paste into the red clay dirt stain using an old toothbrush. Allow the dishwasher detergent paste to remain on the stain on your baseball uniform for two to three hours. Launder your uniform again in the washing machine. Make a paste with powdered laundry detergent and ammonia to tackle really stubborn red clay dirt stains. Allow the paste to sit for 10 minutes, and then launder as usual. Note: Avoid placing your baseball uniform into the dryer until you're certain the red clay dirt stain is removed. The heat from the dryer will set the stain.